No one wants to think about needing to call an electrician: not only do you have to think about having to budget money to possibly make a costly repair, but also you must take the time to be at home while the electrician fixes whatever it may be that needs some TLC or an upgrade. So, when do you call your Colorado Springs electrician? There can be many instances in which you may need to give us a call. 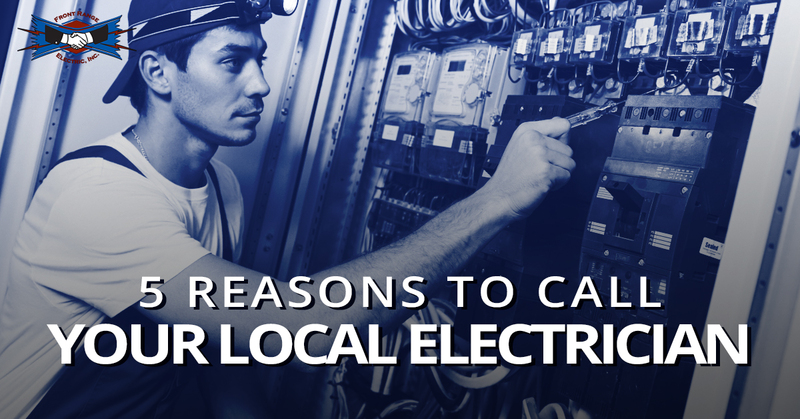 However, here are few occasions that will definitely warrant calling your local electrician. Do your lights flicker, especially when you turn on your hair dryer or other appliance? If they do, then you may need to call an electrician. Flickering lights and appliances mean that you may need to upgrade your electrical system. You may need to install dedicated circuits for smaller appliances. Note that sometimes lights will flicker because there is a disconnection within the light itself. However, if you determine that it isn’t the light that is causing the flickering, then it’s time to talk to your local electrician. Extension cords are a great invention and incredibly useful. However, if your extension cords look like a small tangled aquatic creature, then you may need to reconsider your extension cord use and call our local electrician. Our electricians can help you assess your electrical use and determine what upgrade could help you get the electricity that you need. A panel upgrade or the installation of new outlets with a separate USB port can be helpful. You may not know this, but your local electrician can help you with hot tub maintenance and hookup. Making sure that your hot tub has been hooked up properly and that the wiring is still functioning is a must, not only for your safety, but also for your enjoyment of your hot tub. Though we can’t help you with all the maintenance that your hot tub needs, we are definitely here to help you hook up and maintain the electrical components of your appliance. Does your home need a facelift? Or are you just sick of your home’s design? Maybe a remodel is in order and, if it is, you may want to contact your local electrician. Whether you are looking to knock down a wall or simply change out the lights, it is always a good idea to ask an electrician about the repercussions of the actions that you will be taking during remodeling. Often, new appliances will need a greater electrical supply. However, some new lighting elements might be more energy efficient than their older counterparts. If you move into an older home, it is always a good idea to have the electrical system checked for functionality after move-in, before making any big renovations, and before you set up your award-winning holiday light show. Old wiring, panels, and outlets can be dangerous, energy inefficient, and ultimately cause problems as you try to light and heat your home and use your personal devices. This is not an exhaustive list for the reasons to call an electrician. If something doesn’t seem quite right or you’re unsure if your electrical system is truly working, contact your local electrician at Front Range Electric. We love to help all of our clients in the Colorado Springs area have an electrical system that they can rely on and, quite frankly, will forget about because it is working so well. Visit our website to learn more about us and to speak to one of our electricians.